Well, a lifelong dream of full self-employment doing yacht rigging and diving is finally underway for me this year. I have big hopes for 2010 and bigger plans for years coming. Part of this is Buccaneer Ropeworks a company devoted to traditional rigging, custom fancywork, and other products of general pirate-y interest. Pictured below are a handful of items currently for sale as well as samples of the sort of work that I do. I'm currently working on a line of knotted bottles as well as some voodoo themed items inspired by the book, "On Stranger Tides". 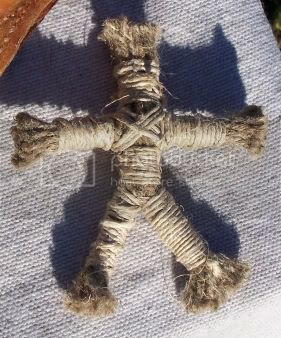 I also stock a variety of sizes of manila 3-strand at very competitive prices as well as sewing palms, real sail needles (WM Smith, available in tubes or individually), modern fids, and other maritime tools. Please PM me if you are interested in prices or having work done. All orders will be handled promptly. 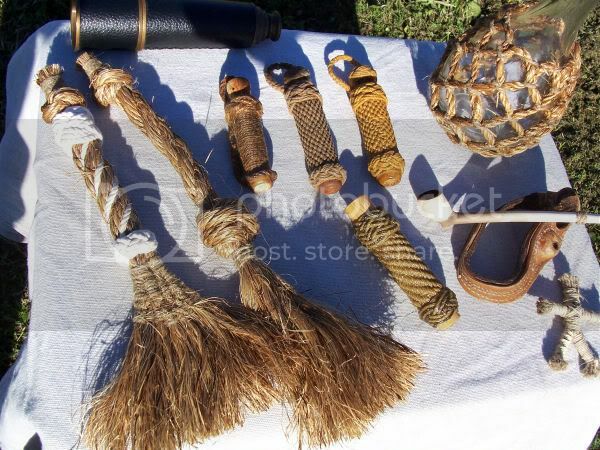 Shown is an assortment of brooms, needle-cases, a bottle, a small voodoo doll (available with pins and a burlap bag to hold everything), and a sample of custom work - this being the handle of an anchor windlass. Best of luck to you in your endeavors! The work looks good there lad, perhaps we will be doing a bit of business soon! A cat I can certainly do. Will get a pic up in a day or two. Hi there my name is Paul (archaeochef) because I was a Chef Lecturer turned Zooarchaeologist. I've been researching 92 worked bones from the foreshore of the River Thames in London near to Tower Bridge circa 1560 to 1780 . Both Brion Toss & Des Pawson now agree with my opinion that they are not Apple Corers as the dealer sold them thought they were but "Fids". 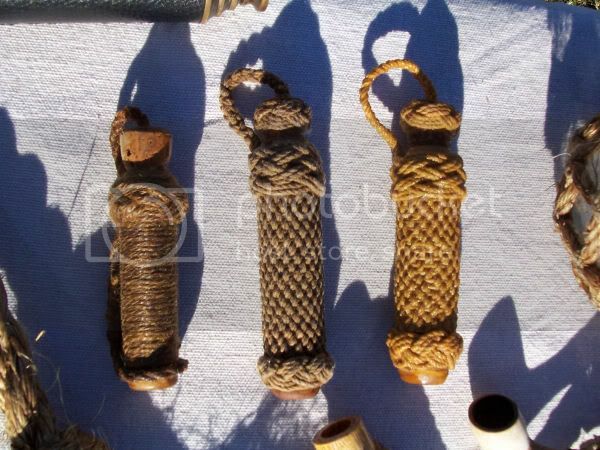 I've made replicas and used them to splice both 1" & 1/2" rope. Not sure how this site works yet so I might not be able to paste pictures if not you are very welcome to have a copy of my paper that has yet to be peer reviewed which I gave at a meeting of the Worked Bone Research Group of the International Council of Zooarchaeology in Belgrade last year, for this I will require an email address. Sorry looks like no pictures I am a bit of a Techno-Dinosaur when come to clever thing with computers. My email address is:- escoffier1951@yahoo.co.uk.